Go watch it, it's fun. A very definite improvement from the last movie. Feels like the evil marketologists have more or less left the show staff alone, allowing for some actual storytelling and character development to occur. The drama's pretty believable. I loved that they haven't forgotten what happened in the first movie. The girls' unique personalities really shine through here, even through body language. The animation is much smoother. There are some surprisingly fun nods to the main series. The antagonists actually have a neat backstory and the music isn't half as annoying as it could have been! It's not as scary as this image suggests, I promise. I wasn't expecting much, but this movie won me over from the very start. * Let's face it, the Equestria Girls world is painfully dull compared to actual Equestria. I love when characters point it out. Naturally, I was absolutely delighted to find out that it's used as a place of banishment. Presumably, more "serious" than Tartarus. So from that we can draw a very amusing conclusion - Canterlot High, and the bizarre little world it's in, is considered worse than hell. I think there's a beautiful amount of honesty in this. * Sunset Shimmer is great. She really stole the show. I had a nagging suspicion until the very end that they'll just use her as a plot device - the villains will corrupt her and the mane6 will show off their virtues by turning her back with yet another rainbow blast. But no. She maintained her integrity throughout and made Twilight and the gang realize they were being selfish jerks to a degree. As it was said on Bronyville, Sunset's sudden change of character at the end of the last movie went like a "lame wrestling face-turn". Well, I'm happy to consider it redeemed. - New monsters. That's always cool. - The girls have more personality. They're not the smartphone-dependant idiots from the first movie. - Maud Pie. That was excellent. - The "local" Twilight. I think she looked exactly the way she should have. Were there any faults I could pick? Sure, but I don't even want to go into it. It's a movie commissioned by Hasbro's evil toy sales department. 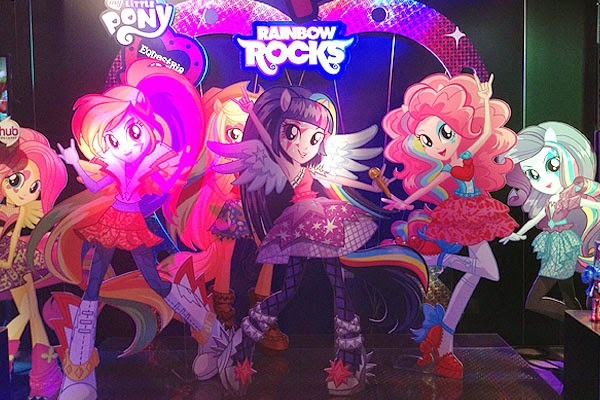 It exists so MLP could rival Monster High somehow. All that considered, the studio did a truly amazing job. They didn't break anything in the MLP universe. You can see that they care, both for the show and the fans, including us "non-target audience". And that's all that matters in the end.